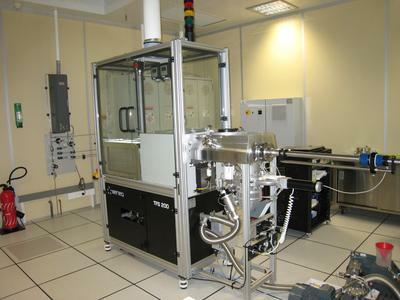 Our Atomic Layer Deposition (ALD, Beneq, TFS 200, Manufactured in Finland) equipement which we brought in July 2009 is physicaly installed in IEMN’s clean room. Injection of the first gazeous precursor on the substrat’s surface and formation of a monolayer constituated of “chemisorbed” and other “physisorbed” species. Purge the reaction chamber with ultra pure nitrogen in order to eliminate any remanent species that have not reacted as well as reaction’s sub-products. Injection of the second gazeous precursor on the surface and formation of the layer of the aimed material. Purge of the remanent sub-products of the reaction. The main advantage of this technique is obviously to be able to make very thin layers and of high purity on a considerable amount of materials. Especially, it allows to deposit a mono-layer on a surface presenting very strong aspect ratios. In fact, this caracteristic of the ALD is carriable because the chemical reactions are done on surfaces and separetely. Three liquid sources each containing the following precursors : TMA (Trimethylaluminum), TiCl4 et H2O which each present high vapor pressures. Four hot sources each containing the following precursors : TEMAHf (Tertrakis (ethylmethylamino) Hafnium), TaCl5 (Tantalum pentachloride), Zr(Net2)4 (Tetrakis (Diethylamino) Zirconium), MeCpPtMe3 (Trimethyl (methylcyclopentadienyl) Platinum). The hot sources can the heated up to 300°C in order to increase the vapor pressures of the precursors, the reaction chamber up to 500°C. This system is equipped with four gas lines: H2, NH3, Ar, O2 than can be used in order to make deposits. Actualy, the TFS 200 comes along with 2 interchangeable reaction chambers, one for thermicaly enhanced deposits (conventional way) and the other one allowing deposits assessed with plasma technique PEALD (Plasma Enhanced Atomic Layer Deposition). This growing technique allows one to carry out deposits at a lower temperature with improved electrical caracteristics. For example, to deposit thermal Al2O3 we will use the TMA precursor and water; water will be replaced by oxygen plasma in the case of an ALD procedure assisted by plasma.